Thundering Hooves Ranch Closed. What’s next for WA grass-fed beef? I’m about a week late with this news: Thundering Hooves Ranch, which I think was the largest Washington State grass-fed beef supplier, has closed. We still have many great local grass-fed meat producers (Skagit River Ranch, Olson Farms, Sea Breeze, Stokesberry, etc, plus many who don’t sell at Seattle farmers markets but do take orders for CSAs or parts of/whole animals). Still, I’m curious what this says about the current state of (and the future of) access to grass-fed meats in Washington State. There are two good Seattle Times pieces on the closure, here and here. Someone commenting on one of the articles wrote, “As I understand it from those who were involved, they would have been unable to survive as a small company given the position they were in.” There was a lot of demand for the meat, but there were debts, which seem hard to avoid in the risky business of farming and ranching, and with quick growth. What does this mean? I’m curious to hear your perspective, especially, but not exclusively, if you’ve been in the business of raising/selling pastured meats yourself. Is the answer to support the growth and sustenance of many smaller grass-feeding ranches, so none is overwhelmed by scale or quick growth, or has such a wide-reaching effect if it closes? Are there ways to bring down the costs for producers? Is the issue that it’s much more expensive to process meats as a small, family ranch than just to sell one’s livestock to a feedlot or intermediary? Ideally, our system of food subsidies in this country would change. Instead of subsidizing wheat, corn, and soy, contributing to the abundance of cheap-and-unhealthy food that’s costing us more in the long run as we get sick––obesity-related illness makes up a large share of medical costs in the U.S.–– I’d rather we subsidized sustainable producers of vegetables and of pasture-raised livestock for meat, dairy and eggs. That doesn’t seem likely to happen anytime soon, especially given current agricultural priorities. The U.S. House Agriculture Committee, for instance, just endorsed a letter to the budget chairman advocating for saving grain subsidies and cutting food stamps. However, defeatist attitudes aren’t going to get us anywhere; the unlikelihood of succeeding in advocating for different subsidy/spending priorities doesn’t excuse us from the need to try. The bottom line seems to be that we need more producers of sustainable meat, and we need to find ways to support those producers, whether that’s via subsidies or increased purchasing, or another means. I’m going to start talking to farmers I know, but, in the meantime, I’d love to hear your perspective. 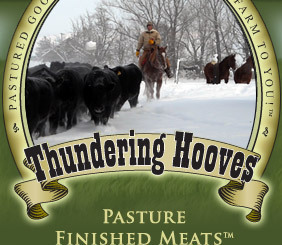 Terminology note: You may have noticed Thundering Hooves’s website used the term “pasture-finished” to describe their meat. In case you’re not familiar with this, that means that the cows weren’t just raised on grass (or hay in winter) and then sent to a feedlot, they was raised on grass for their entire lives. Cows that get sent to a feedlot typically only spend 3-6 months there, but that’s enough to change the fatty-acid profile of the meat pretty significantly. Some producers advertise their meat as grass-fed, or mostly grass-fed, and then find euphemistic ways to say the cows got sent to a feedlot for a while. Grass-finishing, or pasture-finishing, means that the cows weren’t sent to a feedlot. Cows frolicking video: I adored this video from Tom Philpott of Grist.org. It shows cows in England frolicking as they’re let out into the spring pasture for the first time after a winter spent eating dried grass and hay when there was no pasture to munch. Remember, the fat from animals on spring pasture, when the grass is growing quickly, is particularly high in vitamins like vit A and vit K2 (MK-4). It’s also very yellow and extraordinarily delicious. Well, technically she’s already come home. But more on that in a moment. As you might have heard, Rachel, the bronze pig who stands watch over Pike Place Market, charming visitors and raising funds for the Pike Market Child Care & Preschool, Pike Market Medical Clinic, and Pike Market Senior Center & Downtown Food Bank, was involved in a rather serious car accident. In early February, a taxi careened into the market, having been truck by after another vehicle. The taxi was headed straight for Rachel. Fearlessly, Rachel stood her ground (admittedly, she was bolted to said ground) and protected the market. Had she not been there in the taxi’s path, the taxi would have caused far more damage. Rachel was knocked off her base and landed, wounded, on her side. She spent about a month in the bronze pig hospital getting repaired (oh, that we should all have access to such good health care!). Finally, for the last few days, she’s been appearing around the city, appearing at places like ferry terminals and the Seattle Art Museum. 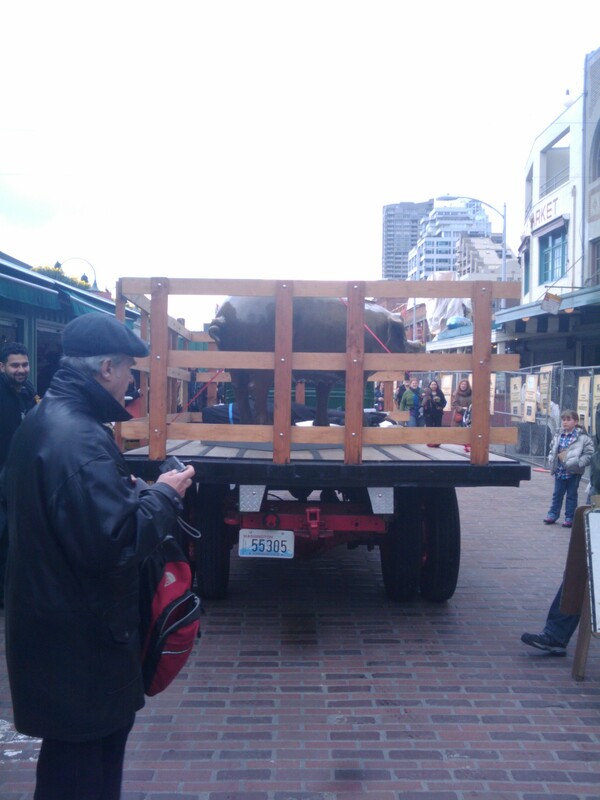 And today, on the back of a 1936 flatbed truck, she’s scheduled to come home to her beloved Pike Place Market. She’s parading from Westlake to Pike Place at 1:30 and all are welcome to come. BUT. Here’s a little secret: She actually already made a grand entrance (a practice one?) Wednesday on said antique flatbed truck. Wednesday, I was at Pike Place Market with two friends from out of town, tasting cheese and heading to have lunch. As we wandered along the cobblestones of Pike Place, I was telling them the story of Rachel’s bravery, and how she would be coming back soon. And, no exaggeration, mid-story… we heard honking. My friend looked up and asked, Is that her? ?” and I saw a 1930s flatbed truck with Rachel on the back turning the corner and heading down the street towards us. People pulled out cameras. Someone shouted, “Rachel! Welcome home!” Two men moved a barrier for the driver, and the truck headed down the street, Rachel standing at attention. Today! 1:30 pm! Perfect for a lunch break to cheer on the brave pig. Maybe buy some daffodils and spring foods while you’re at it. Like many local-food advocates, I admire Michael Pollan for the fact that his writing has made so many people aware of the problems with America’s industrial food system, and aware of the value of pasture-raised feeding over less-sustainable, grain-intensive methods. But I’ve been frustrated since he came out with his seven-word soundbite: “Eat food. Not too much. Mostly plants.” It doesn’t take into account the problems with calorie-counting as a nutritional approach, or the fact that we need––and are deficient in––large amounts of vitamin forms and fats found only in animal products. But I suppose I’ve been too lazy to come up with a better, catchier soundbite. Laziness has paid off. Another blogger, Craig Fear of Pioneer Valley Nutritional Therapy,has gone ahead done it, in a nicely detailed article on some of the reasons Pollan is wrong. Craig’s soundbite: Eat real food. Eat a lot. Mostly local. I love it. Check out Craig’s full article here. Take one part mid-March, one part cabbage, and one part meat, and stir into the collective mind. I’m guessing Irish food comes to mind, with its cabbage and corned beef or its stews of lamb and cabbage and wintry vegetables. But you’d be surprised how versatile these humble ingredients can be. This dish is a little less Ireland, a little more Italy. I’m okay with that; as much as I love Ireland, Italy has better weather right now anyway. And fantasizing about better weather is about as tantalizing to me right now as taking a break from studying to make a delicious-yet-easy lunch. This is another (Paleo/low-carb/celiac-friendly) dish for people seeking or willing to try interesting substitutes for noodles. I do eat rice pastas sometimes, but try to limit my grain intake. Plus, substitutions often have a lot more flavor. In this case, I’m sautéing strips of green cabbage in a whole lot of good butter with a pinch of salt, and then testing it with different kinds of sauces. The trick is that you only want to use the top half of the green cabbage for this, before the harder white part starts. Save that for stir-fry. For a few friends recently, I made cabbage like this with caramelized onions, mushrooms, cream, parsley, saffron, and dried cherry tomatoes, a little like a pasta with cream sauce. It didn’t taste like noodles, but it did taste like a delicious and fatty cabbage dish. Today’s experiment: a simple lamb-tomato sauce. Really easy. 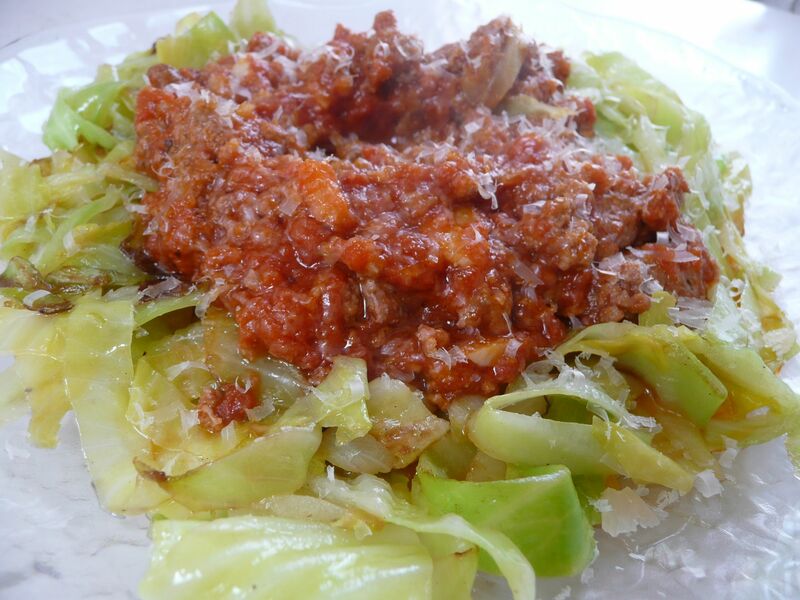 The kind where you throw two cloves of chopped garlic and a patty of ground lamb into a pan with some olive oil, stir and add salt, add some tomato sauce, and simmer until your cabbage is done in pan #2. It works really well. The cabbage has most of what you’d want from a noodle: it’s chewy, flexible, buttery, and well-matched to the flavor of the sauce. 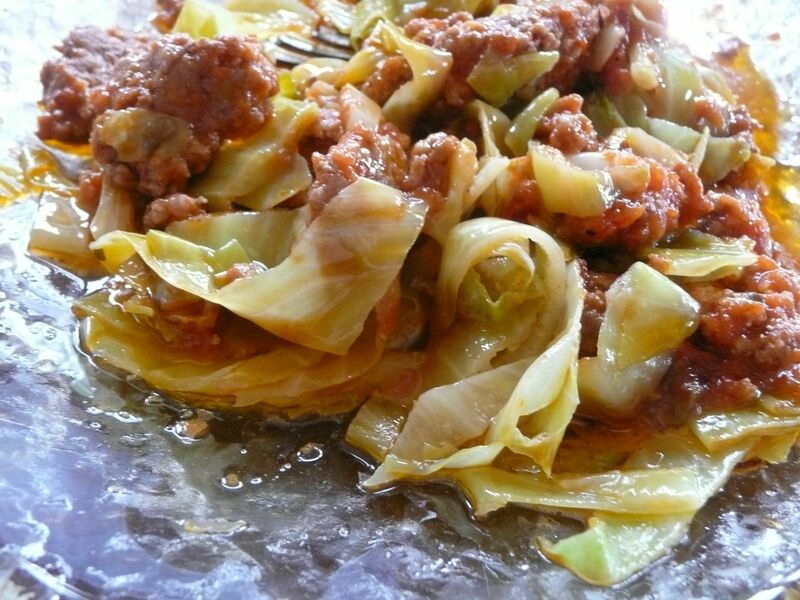 The chunkiness of the sauce from the meat doesn’t just make this more filling and healthful, it helps the dish avoid being too watery, since cabbage doesn’t absorb sauce the way a traditional noodle does. If you have sauce left, well, that’s what spoons were made for. Easy. Healthy. Tasty. Filling. Faster than boiling pasta. Back to studying for biostats! 1. In one pan, heat olive oil to medium heat. Add ground lamb and break up with a wooden spoon. Add garlic. Stir, salt, adjusting the flame to make sure the oil doesn’t smoke. 2. 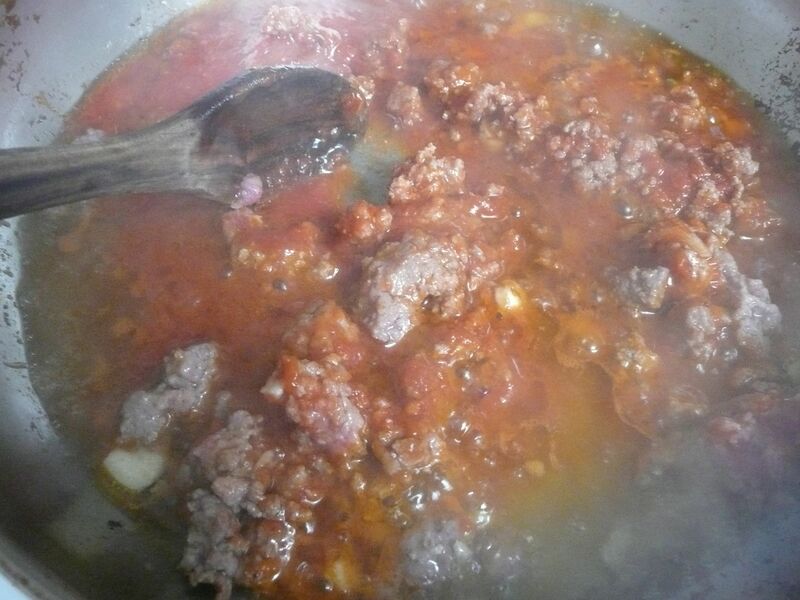 When the meat is browned, add tomato sauce. Stir to coat, turn the heat down very low, and leave alone. You want the flavors of the lamb and tomato to combine well, and you want the sauce to thicken, so it’s not runny on the cabbage. 3. Slice your cabbage. 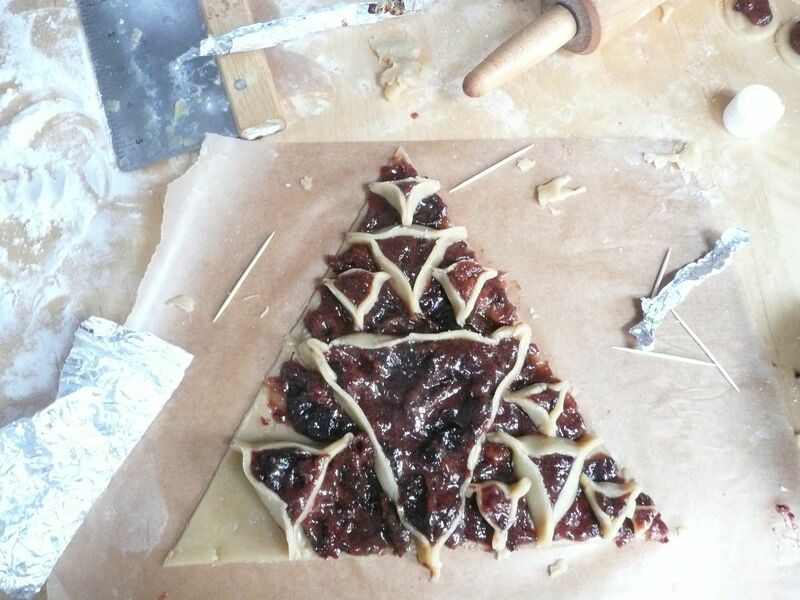 Remember, you’re using only the top portion, where the leaves are thin and green. 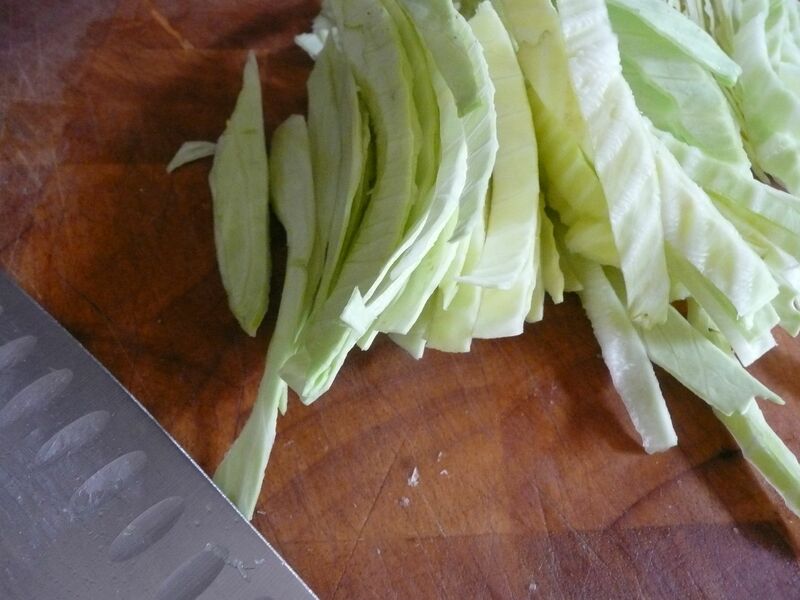 I cut the cabbage in half around its waist and then in half again top to bottom, so it’s easy to slice off strips. Cut them about the width of fettuccine, maybe 1/4 to 1/2 inch. 4. In pan #2, heat a lot of butter. Add cabbage. Stir. Add more butter as it absorbs yours. Add a little salt to taste. 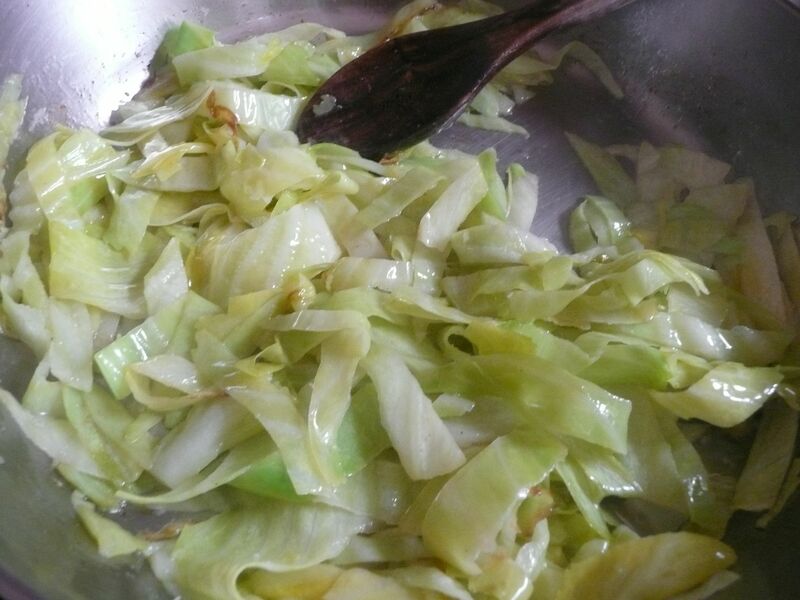 Cook until the cabbage is completely wilted and slightly brown in a few places, about seven minutes. 5. Arrange cabbage on the plate. 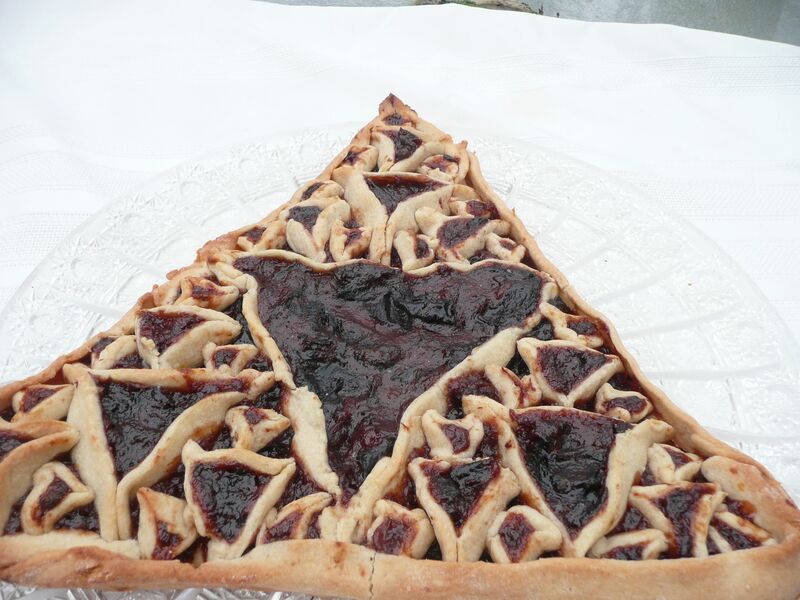 Arrange sauce on top. Add any extras you’d like, such as parmesan or black pepper or parsley or even things that don’t start with a p, if you’re feeling really adventurous. Serve. Spring is coming! Yeah, so maybe it’s still cold and rainy and we haven’t seen many springtime ingredients yet. But some nettles are starting to come up, as are some other early greens, both wild and cultivated. And one of these greens is probably right in your yard, if you have a yard, and you probably want to pull it up anyway. That’s right, it’s dandelion green season. Dandelion greens are best when they’re very young, with thin, narrow leaves growing in a rosette that hasn’t yet produced a flower. They’re slightly bitter in a good way, they’re delicate, and they don’t get slimy like spinach when cooked. They make great pesto too, if you have the patience to pick enough and clean them. 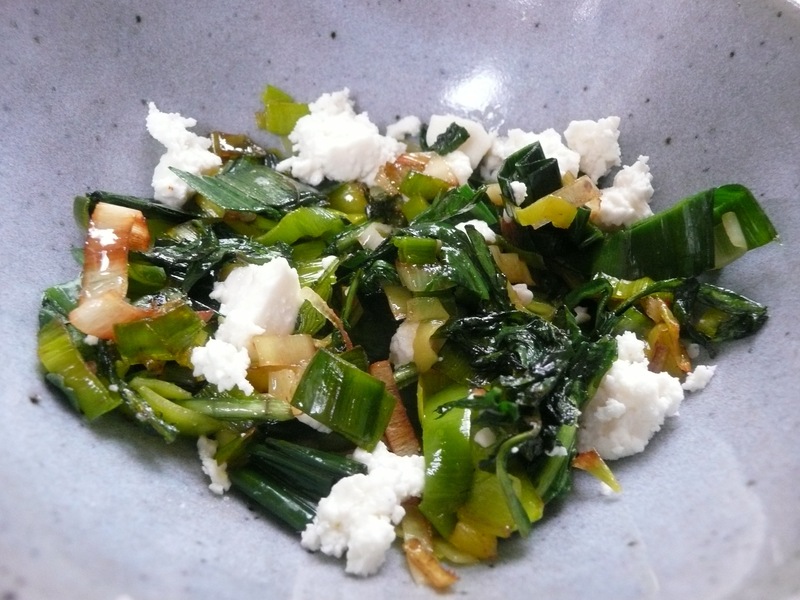 They also go fantastically well with one of the other few things we’re getting already this season: leeks. Sauté the two together in some yellow springtime butter with a little salt, and the leeks get a certain sweetness that perfectly balances the dandelion greens’ flavor. 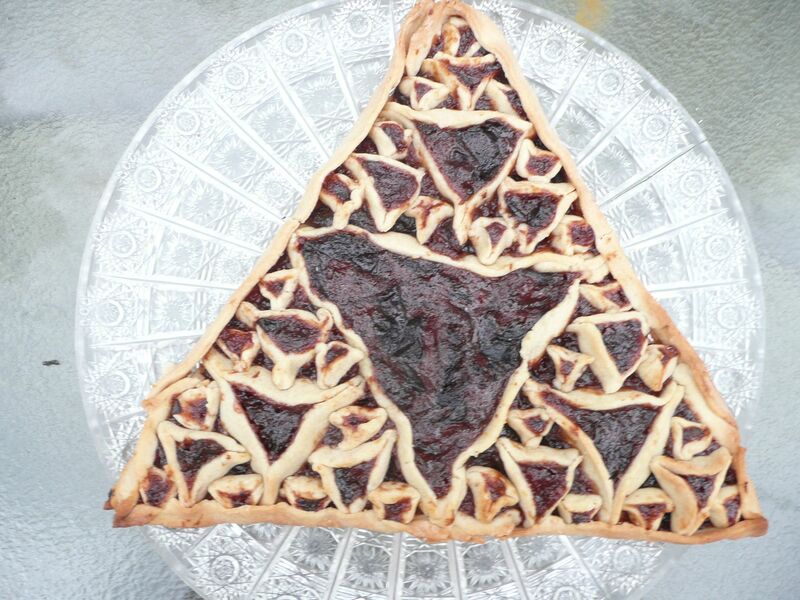 So very tasty. The result is great on its own, mixed with mild spring cheese, tossed onto scrambled eggs, spooned on top of broiled meats, stuck into the center of buckwheat crèpes… Basically, use it anywhere you’d like a savory flavor. I ate mine with scrambled eggs and a bit of some fresh cheese my friend kindly left in my farmers market bag on Saturday. 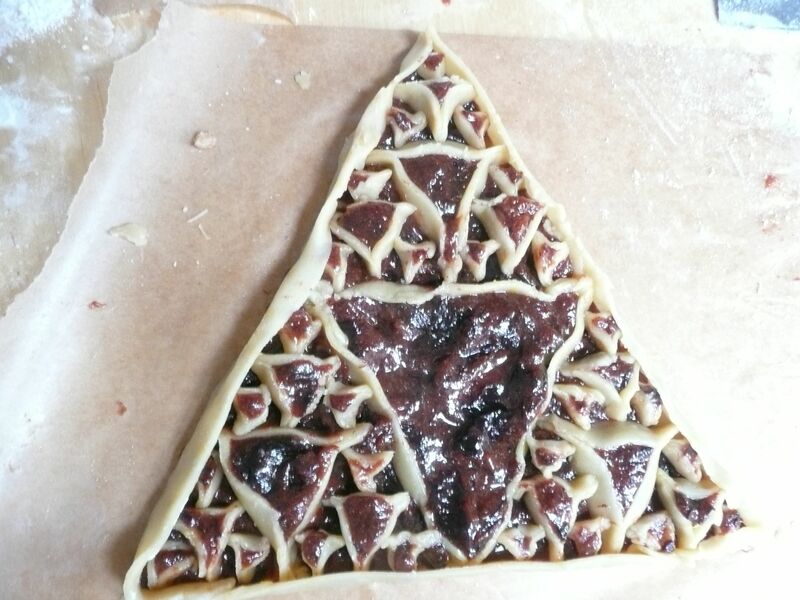 It seems silly to write this in recipe form, but here you go. 1. Remove roots of leek and outer hard layer(s). Wash well. 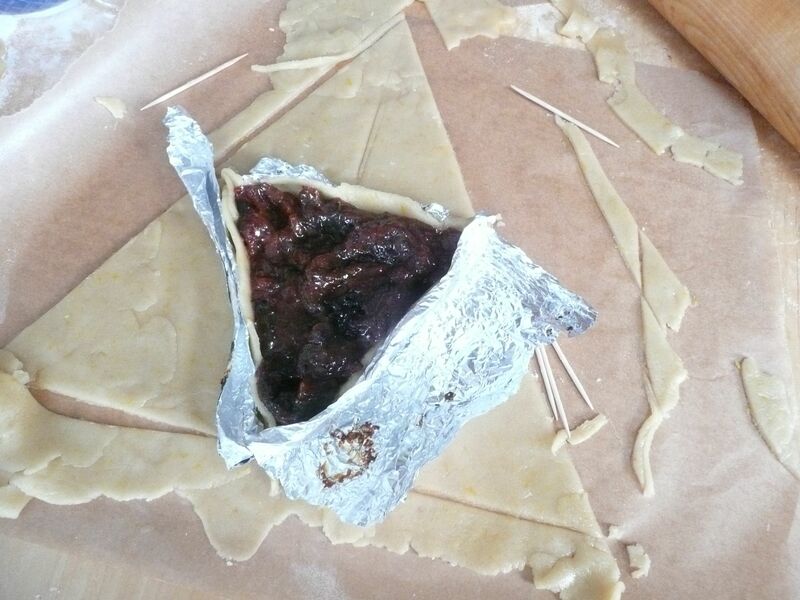 Slice into thin strips. 2. Heat butter. Sauté leeks on low heat (they burn easily). Add a pinch of salt. 3. Add dandelion greens. Stir until wilted. Taste to adjust salt. 4. Add to any other recipe or eat as is. Diet and ADHD: How much is a response to dietary intervention about gluten? NPR reported today on a new study in The Lancet in which researchers examined whether dietary intervention can improve ADHD symptoms in kids. Researchers found a significant decrease in ADHD symptoms with the specific diet. 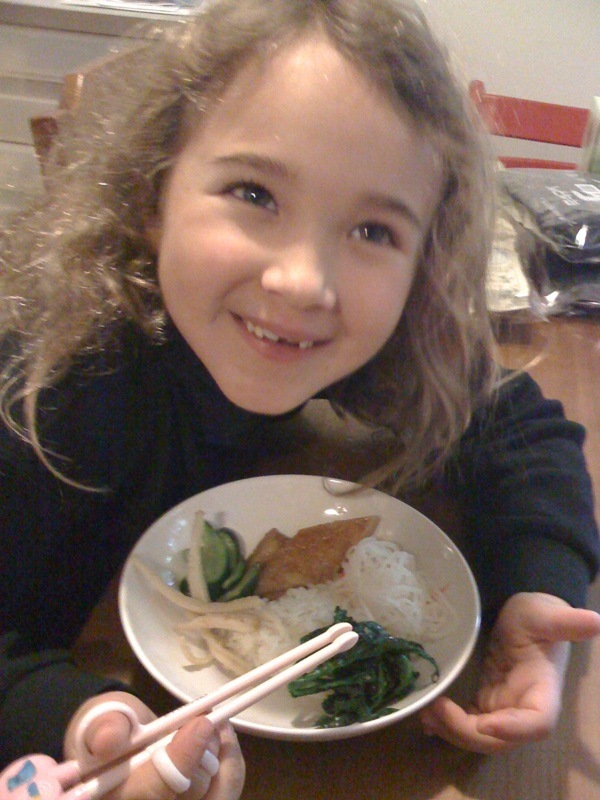 Kids in the study ate an elimination diet primarily of rice, meat, vegetables, pear and water, although I was surprised to see they included some supplementary wheat as well. 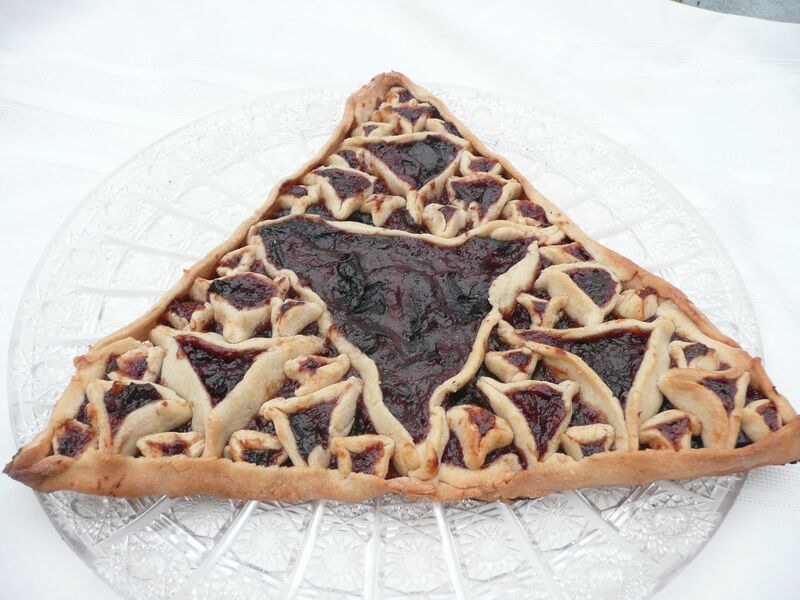 This is not the first study of ADHD and diet. Another review of 35 years of dietary research suggested kids with ADHD are sensitive to artificial food colorings and preservatives, and that this sensitivity typically co-presents with sensitivities to milk, chocolate, soy, eggs, wheat, corn, legumes and sometimes grapes, tomatoes, and orange. I’m curious about the inclusion of wheat in the Lancet study because there’s some interesting research about gluten and ADHD. Some of this research focuses on people with celiac disease specifically, such as one study of children and adults that suggested untreated celiac disease (e.g. people with celiac disease who still eat wheat, rye and barley) can manifest ADHD-like symptoms. In another, admittedly small study of children with autism, some of whom also had ADHD symptoms, researchers removed gluten and casein (which comes from dairy) from the diet and found significant improvement of ADHD symptoms among the ADHD subset. But gluten can’t be the whole picture, as the newer study suggests. Of course, it’s rare that only one dietary component is responsible for large-scale effects on the body, even with obesity. I’d like to see more research on the role gluten plays. For those who may have gluten intolerance and may not know it, it’s worth leaving gluten entirely out of your diet for a minimum of three weeks and seeing whether your health improves — you may see other surprising effects, like an improvement in lactose tolerance. A friend asked me about sugars and ADHD. The research on this could be better, but it’s interesting. A lot of it seems to focus on short-term changes in symptoms instead of effects of a longer-term dietary change. One study showed significant immediate response of ADHD symptoms in kids fed sugars/high-carbohydrate breakfast. Another study found no significant effect of sugars or food dyes. My guess is that sugars play a long-term role in worsening ADHD symptoms, and I’d like to see more research. I’d especially like to see fructose/high-fructose corn syrup examined in more detail, considering its unique relationship to changes in metabolism and weight (study – full text!). Also, trace mercury, which can also contribute to ADHD, has been found in HFCS (full text) . The study uses an elimination diet, which grabs my attention more than many studies of association between diet and health problems. Nutritional epidemiology is notoriously difficult; even each of the standard means of measuring food intake has flaws. So what to do with this information? 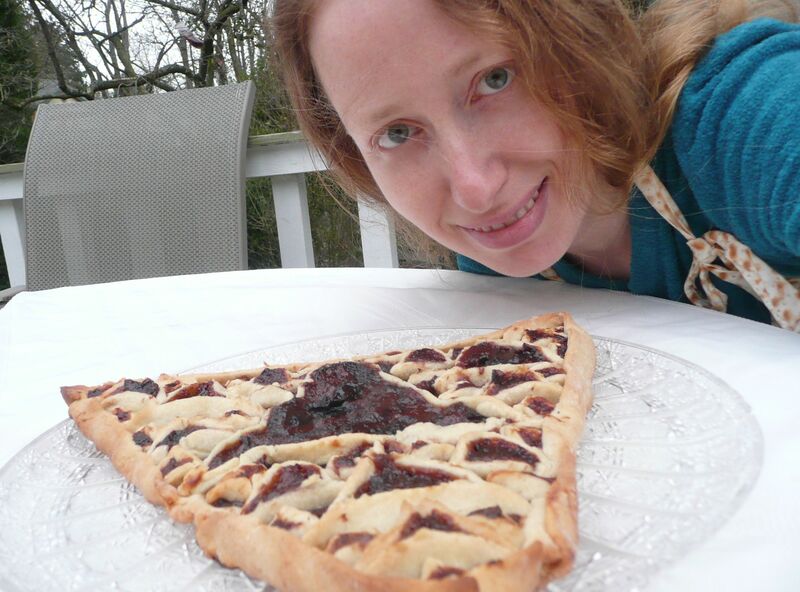 There’s a sub-camp of nutrition advocates who, in response to this kind of research, will say just, “It’s what we know; eat a diet of whole foods and you’ll be fine!” I don’t precisely agree with this. “Whole foods” is a very vague term, for starters, and has been co-opted as a marketing term. The attitude also doesn’t account for changes in the nutritional value of food from, say, changes in how we feed animals or treat soil. The attitude includes all “whole” grains, not accounting for some of the real health problems associated with gluten, or for historical changes in how societies treat grains (e.g. no longer soaking, sprouting or fermenting them). But some of that general message is right, in that what people commonly refer to as whole foods don’t contain added sugars or dyes or preservatives. Still, I’d change the message to something like: Eat whole foods from animals raised on pasture and vegetables grown without pesticides. Avoid or limit gluten grains, and treat other grains traditionally. Limit the other stuff, and do what’s right for you. And now, go ride bikes! Thanks to citymama for the Creative Commons photo.